Pakistan has recalled fast-bowler Mohammad Amir, leg-spinner Shadab Khan and opener Fakhar Zaman for the South Africa Test Series. The first of the three-match Test Series will be commencing from December 26 at Centurion. After facing severe criticism owing to his failure to pick even a wicket in three Asia Cup matches in September, Amir was dropped from the side. He then turned to domestic cricket where he played four first-class and two list A matches for Sui Southern Gas company and took 23 wickets, which includes two five-wicket hauls. With Mohammad Abbas in the squad, Amir's inclusion is bound to further strengthen Pakistan's pace attack in favourable seam bowling conditions in South Africa. Fakhar Zaman and Shadab Khan, who missed out the New Zealand Test Series at home owing to knee and groin injuries respectively, are also making a comeback to the squad. Zaman had an impressive debut earlier this year against Australia where he scored 94 and 68 in the first and second innings respectively. Amongst others who are also staging a comeback are opener Shan Masood and back-up wicket-keeper Mohammad Rizwan. "The best possible squad has been selected keeping in mind the conditions of South Africa," said the chairman of selection committee Inzamam-ul-Haq. "Three openers have been selected in the squad where Shan Masood has been selected after the retirement of Mohammad Hafeez from Test cricket. 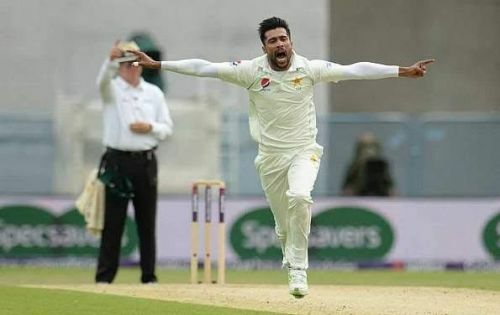 Mohammad Amir makes a comeback in the team after regaining his form in the domestic cricket, giving strength to fast bowling attack that includes four pace bowlers. Mohammad Rizwan has been included in the squad after performing consistently in the domestic cricket and for Pakistan 'A'." The second and third Tests will begin on January 3 and 11 at Cape Town and Johannesburg.